An inspirational cat lover from Shepton Mallet, Somerset, is gearing up to run her 66th marathon for Cats Protection, despite suffering from a serious health condition. 45-year-old Emma Challis has been a volunteer cat fosterer for Cats Protection’s Glastonbury & Wells Branch since 2010 and has represented the charity at every marathon she has run so far. Emma began running long distance in 2013 as a way to help her strengthen her muscles after recovering from two serious accidents; she damaged her spine in a car accident in 1997 and then fractured her pelvis after falling down the stairs in 2007. Then, in 2016, Emma was diagnosed with a long-standing blood clotting condition which had caused her pain for many years. 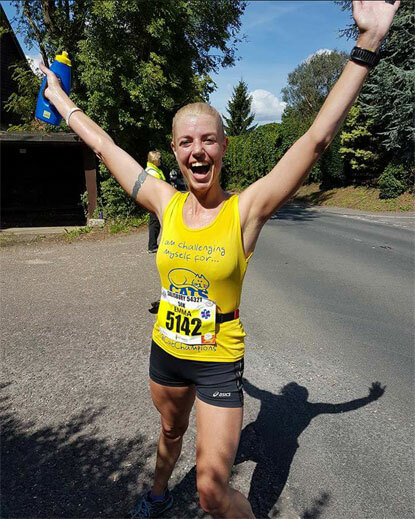 At a hospital visit a few days after completing the Taunton Marathon she was told that she had ‘multiple prominent clots’ in her lungs. Emma’s doctor has recommended running as a good way to prevent her blood clots, and so after recently completing the New Forest Challenge Marathon she is now preparing for her next few events; the Taunton Marathon on 8 April and the Brighton Marathon on 15 April – her 66th marathon. Last year, the amount she raised in sponsorship from her runs, plus adoption fees for cats she rehomed, totalled an incredible £1,100. Emma, previously a vet nurse and now a mobile beautician, also has two rescue cats of her own, a tabby-and-white female called Diddy Kitty and a black female called Isis. If you’re interested in taking part in an event for Cats Protection, visit: www.cats.org.uk/running email events@cats.org.uk or call 01825 741 960.